In a rural road design cross section we normally design from the center line. Typically we set our road pavement to slope from the center at about -3% for the width of the road. We would then hang off a shoulder and then slope to the natural surface and maybe include a drain for drainage purposes. In the Urban situation we often have more constraints that we must design for. Typically we already have existing buildings or other utilities along the existing road edge that we must fit the new design into. In this tutorial our client has supplied us with some raw data picked up with a total station. They have picked up points along the existing road center line as well as points along the bottom and top of the existing kerb drain; as well as some existing foot path. We have also been supplied with three string files that define the new center line as well as the bottom of the new kerb and gutter. This data is found in the job "UrbanRoad". As the data consists of random shots; ie not picked up in cross sections we will do the following to create the new design long and cross sections. 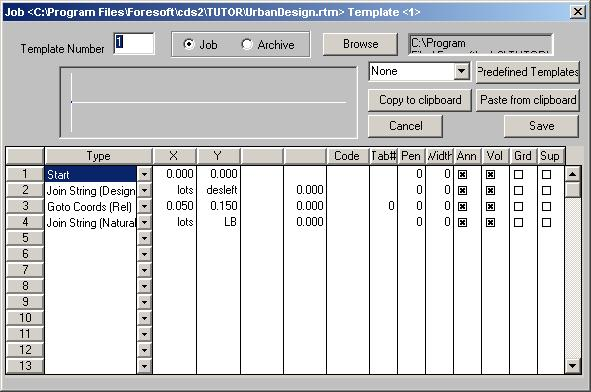 Bring up the job "UrbanDesign" in CDS. If we triangulate and contour the job as supplied you will find that the triangles cross over the drains both to the left and right of the job. We need to define some break or discontinuity lines that will correct the triangles for us. Looking at the job you will notice that the kerb points have been coded for the top and bottom of the kerb as "tkerb" and "bkerb" respectively. This is good as we can use this to create some break-lines that can run along the top and bottom of the kerb. However the field party has not differentiated between the left and right kerbs. In this case we will massage the coding in the office to fix up the coding so that we can have both left and right top and bottom's. You will notice that the strings are placed into the discon1 folder so that the program will recognize it as a break line. Press the "Apply to DB" button to create the string lines. We can now go and recreate the triangles. You will notice that the triangles now lie along the left and right kerbs. I have also taken the liberty of manually adding in a couple of triangles at the top right and bottom left of the job. This option is under the "Contour - Edit Model _Add Triangles" menu item. The two triangles added in were 40,46,39 and 18,4,19. Also now create some contours to check that the triangles adequately represent the job. The contoured surface is shown below. On inspection the surface representation appears reasonable. We can see a ridge representing the center of the road as well as the kerbs to the left and right together with a footpath to the outside. 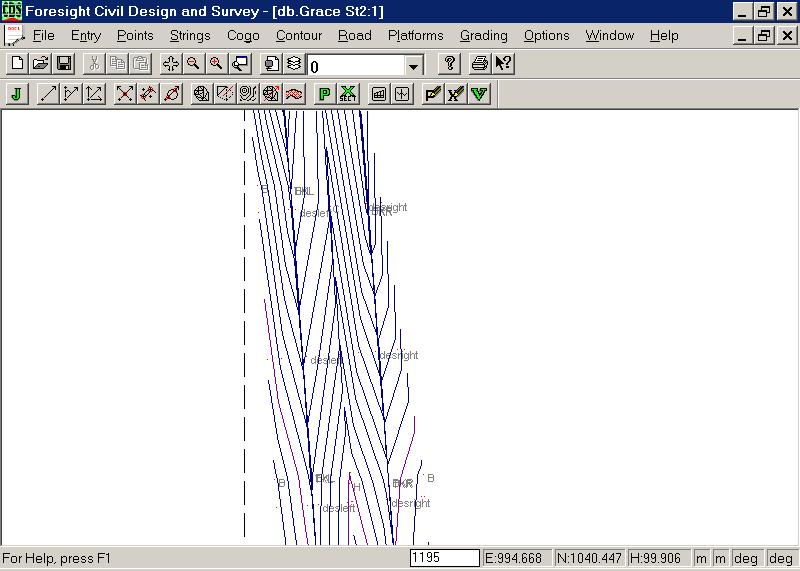 We are now in a position to run the interpolate profiles and sections to create tables for the road design. 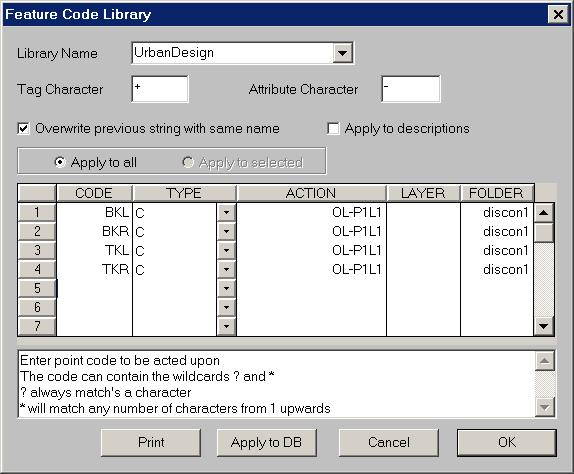 Select the string "des" in the lots folder. Run the interpolate profiles and sections. Detailed instructions on the interpolate profile and sections item will be found in a previous tutorial. We now need to also create profiles along the left and right kerb edges. Select the string "desleft" in the folder "lots" and then from the "Contour" menu do "interpolate string profile". Repeat for the right hand edge string "desright" in the folder "lots". We are now in a position to use our design skills to create design profiles along the design center line as well as the left and right kerb profiles. In this case we have three design profiles; the design center line as well as the left and right kerb lip. We are going to do each design in turn. Press the P button or select the "Road - Natural Profile - Profile Parameters" menu item. Make sure the selection is by strings and select the "des" string. In this design we are going to drain water from about a third the distance along the designs. The designs for the left and right kerbs are done in a similar way. First select the string in the parameters table. After doing the respective designs we have the following display. The reference lines are shown dashed. This can be set up back in the reference parameters. We are now ready to display the cross-sections for the appropriate chainages (stations in the US). 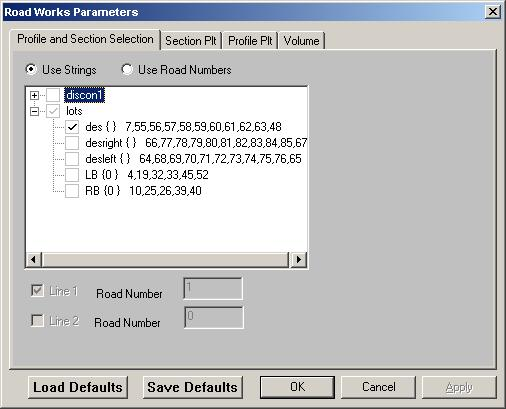 The first thing is to define the section parameters in the road parameters. Press the Road Parameters key (big green P); and select string "des". We are now in a position to define our template cross-sections. In this example we are going to start from the center-line. On the left side we are going to join across to string desleft and then draw in a drain and join up to the left most edge of the cross section. This example is going to achieve this by hanging a single template off the left and right of the center line. We are not going to hang templates off the left and right kerbs. Join to string "desleft" using designed height. Join to string "LB" using ground height. Fill in standard template 2. In this case we are joining to string "desright" at the second line. Everything else is the same except we end at string "RB". We can now fill in the template positioning table. Bring up the profile positioning table. This is done by right clicking in the section view and selecting the template positioning menu item. Fill in 1 for line1 left and 2 for line 2 right. We can now review our design by stepping through the sections. A typical section is seen below. The design has been completed. You should now check the grades to check whether they are within allowable ranges. For example the pavement grade at chainage 0.000 is a grade of -5.8%. To change the design you simply have to change the profile designs to match your required output. For example to change the right kerb profile; in road parameters bring up the profile design and turn on string "desright" and then adjust your profile design accordingly. In the section view you can see the changes by scrolling through the sections. You can now print out your sections and present them to your client.